We have social anxiety disorder, premenstrual dysphoric disorder (PMDD) and any number of odd disorders in the DSM IV, none of which I have. How about PBTDD, or pre-Boston-travel dysphoric disorder? When I have to travel in Boston, I get the worst anxiety. Driving only. If I can take the T, it's no problem. But driving the streets of Boston or any of the surrounding towns just fills me with dread. Give me Manhattan any day of the week. At least it's a grid. Boston is anything but a grid. I think the roads were originally meandering cow paths. I am going to Boston today to see some friends. Then flying to an interview for fellowship in Ohio, which means Logan. Ugh. I was pleased to find out that it's a little easier to get to the airport via the T (Red Line to South Station to get the Silver Line to Logan). The last time I lived there, that did not exist. You had to take some concoction of the Red to the Green to the Blue and then get a shuttle. Much less confusing now. So, off I go through the snow. At least it's a Saturday, so you crazy Massachussetts drivers won't be driving in the breakdown lane. Seriously. Who thought that would be a good idea? Children are precious. My housemate from medical school has a 7 month old baby girl with chubby, dimpled cheeks. Her parents sent a picture of her with her faithful, omnipresent dog, Bosco, as their holiday card, which now adorns my fridge. Every morning, I look at her smile and and am thankful that there are loving parents in this world and children who receive their undying devotion. These words describe for medical providers the nightmare that some children endure. I am left wondering why. I am left wondering if any explanation could ever suffice. 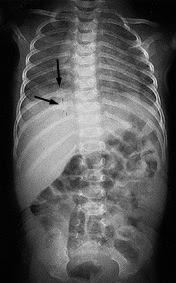 Pleural effusions are collections of fluid in the pleural space (the space in between the lung and the chest wall). 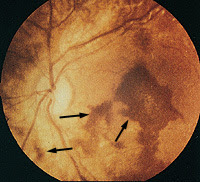 In the lateral decubitus film shown here, Arrow A shows the fluid layering out. 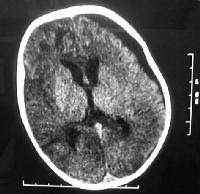 Directly above the fluid is the right lung, somewhat squashed and displaced by the fluid. You can imagine that that would make it harder to breathe. Arrow B shows the normal width of the right hemithorax. There has long been a debate between general pediatricians, pediatric surgeons and pediatric pulmonologists (as well as infectious disease specialists) as to how best to manage these cases. Option A is conservative management with IV/PO antibiotics. This is really only an option for kids who do not develop respiratory distress. 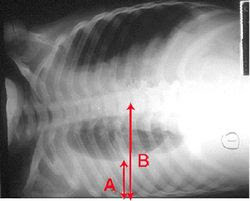 Option B is diagnostic and therapeutic thoracentesis. Option C is a chest tube, which is really just an extension of Option B. Finally, Option D is surgical intervention with VATD, or video-assisted thoracoscopic decortication. If you read the surgical literature, early VATD shortens hospital stay and duration of chest tubes. The rest of the literature is less conclusive. 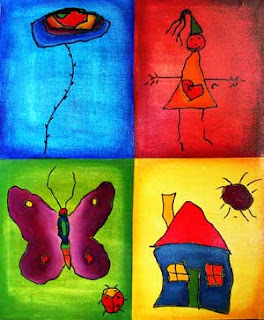 The management, as a result, depends on who you ask for a consult first, a surgeon or a pulmonologist. My bias might be obvious to some. The last child is still admitted. The chest tube is still in, post-op day 2 today. Apparently the pleural space was a bit of a mess of pus. I did the thoracentesis, my first. It's not a technically difficult procedure, but it was still pretty cool. For those not familiar with the term, the procedure consists of sticking a needle in between the ribs and drawing off fluid from the pleural space. The tricky parts are sticking a needle into an awake, crying baby and not aspirating the lung by sticking the needle in too far. If you are doing a therapeutic tap (i.e. drawing off as much fluid as you can get out), you can cause air to enter the space and create a pneuomothorax (literally air in the chest). If you draw off too much fluid, you can also cause hypotension. Not a good thing. I am happy to report that neither of those complications occured. 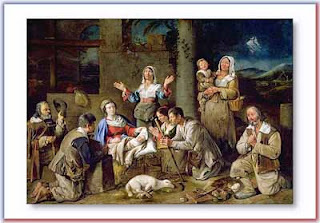 the nativity scene is still up in the entrance of the hospital where i toil. one could question the propriety of putting up a nativity scene in a hospital that serves diverse cultures and religious faiths. one could argue that if you display a nativity scene at all that you should also put up displays important to other religious faiths and cultures during this time of winter celebration. Bloomingdale's actually had some fantastic window displays this year doing just that. Each window depicted traditions from around the world, including Ireland, the Netherlands, and Kwanzaa. one might draw the conclusion that keeping the nativity scene up in january is simply in poor taste. or perhaps it is just lazines in taking it down. here's to a more tolerant, peaceful 2007, no matter where you are from, no matter what you believe. 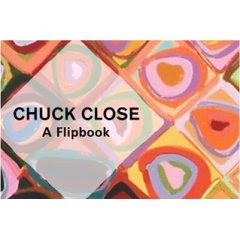 it was a flip book of chuck close's self portrait. if you happen to find it on some store counter somewhere, take a flip.